Update: I don’t write articles anymore. Maybe I’ll do one here or there, but my focus is elsewhere, so don’t use these tips to pitch me–it won’t work because I’m not writing anything about anyone. But I’m leaving this up because a lot of people have found it helpful to use as they pitch other writers. Since 2013 I’ve written over 300 articles for publications like Time, Inc., Forbes, Entrepreneur, Mashable, VentureBeat, and TechCrunch. The more I write, the more people get to know me as a writer, and this means I receive a lot of pitches from startups, entrepreneurs, PR firms, businesses, and other parties who want me to write an article about them. I typically receive around 50 pitches per week, but sometimes it’s over 100. I respond to less than 1% of these pitches. It’s not that I wouldn’t like to write an article for everyone who wants one, but I can’t–even if I did nothing else there isn’t enough time in the day. I can’t even respond to every pitch. Every other experienced writer out there is in the same position. But that doesn’t mean you can’t get me to write an article about you or your company. There are ways to break through and get me, or another writer, to give you the coverage you want. But first, let’s talk about how not to pitch. Do not pitch 100 journalists at once. We can see through you in 0.25 seconds when you send your email to 100 of us at once, or do a copy and paste with minor customization. We don’t want to write a story someone else might write at the same time. One pitch at a time is the way to go. Do not make it about you. When you want someone to do a favor for you, show that person how doing that favor benefits them. Give value before expecting it. Do not make it about you. I mean this literally. Do not pitch a story about yourself. Don’t pitch a story about your business. Some publications no longer even allow profile pieces. Do not tell me you’re special. You’ve got a great company that does great things for people? Let me guess, your company is innovative, revolutionary, and disruptive, right? Yeah, that’s what the other 50 people who pitched me this week said about their companies. Do not make it long or detailed. The longer your email, the more likely it will be ignored (TL;DR) or marked for follow up. How often do you get back to the emails you mark for follow up? Do not follow up too much. Day 1: “Would you please write an article about me?” Day 2: “Perhaps you didn’t receive my email yesterday, I’d like you to write an email about me, please get back to me soon.” Day 3: “You probably missed the first two emails I sent, but I’d really like you to write an article about me.” This type of pitch will be ignored, or marked as spam. Do not send pitches like this: “hi, can you help me publish on forbes unde ryour name please?” Yes, that’s a real pitch, and I’ve received 100 others like it. Do not act as though you’re doing the journalist a favor. Journalists aren’t sitting around wondering what to write about. Most of us have 50 great articles we’re working on. If we want to write your article, we have to postpone a different article. Do not use pitch templates. Or if you do, don’t use one anyone else has. There are lists of pitch templates out there. 90% of the pitches I receive are using these templates, so they become recognizable very quickly, and just as quickly they get filtered out. Anything that looks the least bit like a template gets deleted immediately. Now, let’s talk about how to pitch. I don’t get paid to write. Well, ok, maybe I’ve been paid two times out of the 300+ articles I’ve written–and I would have written those for free if they hadn’t waved money in my face. I’m a contributor, not a professional journalist or staff writer. That means I write for free, or at least I don’t get paid in cash. I get exposure for my agency, clients for my CMO coaching services, and a stronger personal brand. If you’re pitching me and thinking “Why doesn’t this guy want to write about me? I mean, this is what he gets paid for, right?” No, I don’t get paid to write about you. In fact, it’s going to cost me money to write about you. Either it takes my time or it takes the time of my staff who assist me with article research, drafting, and editing. Each article I write costs me around $800 in time and/or direct costs. If you want me to write about you then you need to show me how I get “paid” for it because your article is going to generate clients for me or build up my personal brand. If you want me to write an article about you, you have to figure out how I will get what I want by giving you what you want. For other contributors it’s mostly the same–they get “paid” in some roundabout way. There may be a few who do it just for fun, but many are building a personal brand that they use to sell books, get speaking gigs, improve their job prospects, land clients, or sell product. And no, you can’t pay me cash to write an article about you. It’s against the agreements I have with my publishers to accept pay. I know people who do it. Some of these are well-known writers on well-known publications. I’m not going to refer you to them. I’m not going to out them, either. I don’t know exactly what their agreements are with the publishers, although I suspect they’re the same as mine. Regardless, that’s their business if they want to violate their agreements. I’ll focus on sticking to mine. I primarily write about one thing–how to become an influencer or thought leader, and especially how chief marketing officers or CMOs can become influencers. If your pitch doesn’t include this angle, I’m not the right person to write your article. I don’t write about Kickstarter campaigns, I don’t profile successful leaders, I don’t write about up and coming entrepreneurs, and I don’t write about “innovative companies.” Do I make exceptions? Sure, if Clayton Christensen called me up and asked me to work with him on an HBR piece about the application of innovative disruption to the mink farming industry I’d do it. If Richard Branson emailed me and asked me to write an article about solar-powered screwdrivers I’d be all over it. In the past I’ve written a lot about startups, leadership, productivity, trail running, home schooling, and government policy, and I’ve still got some articles on those topics that are yet to be published, but that was then, this is now. The same goes for other writers–you can usually tell what they will write about based on what they have written about, but not always. However, no matter what your business is you can still get me to write about you if you tweak your pitch. If your company provides online legal services you could pitch me on how your company has used your CMO’s social media presence to successfully market your services. Or your IoT toy company could pitch me on how you were able to build an email list of 10,000 subscribers in two months. Your health product company could pitch me on how SEO helped it grow revenues by 200% in one year. Those are all stories I’d be interested in, because they relate to influence and the more stories I can write about influence the better. Personalize your pitch by noting a connection we have. Do we know each other? Did you also go to BYU for university? Are you from Los Angeles? Do you like Dinosaur Jr.? Do you skate? Put “I saw that you’re a skater, I’m also a skater…” at the beginning of your pitch. That way, in 0.25 seconds you’ve told me I’m not merely one of 200 other writers you’re sending your pitch to, but that you specifically reached out to me, and only me. The last thing I want to do is spend three hours working on an article (for no pay) and then, when I go to publish, find out that 10 other people have published essentially the same article in the past 24 hours. If you send me a pitch without any personalization then I assume this is what’s going to happen, and your pitch gets deleted in 0.5 seconds. I want to write stories that readers love and share. Help me help you by pitching me a story that focuses on readers want, rather than on what you want. I know you want a story that talks about how great you are as an entrepreneur, or about how great your company is, but unless you’re Elon Musk nobody cares. Sorry, but it’s true. That story might be good for your ego, but hardly anyone will read it and fewer will remember it. Instead, deliver value. You’re an expert on whatever it is you or your business does, so give me some tidbit of information you know, but which your customers may not know, but would be super helpful to them. The articles I’ve seen the most financial success from had titles like “How to hire an SEO firm” and “How much should SEO cost?” Someone who is trying to hire an SEO firm and has been burned before and feels like he’s about to get ripped off again will be very interested in reading those pieces, and will get a lot of value from them. My agency does PR work for clients and when a client can’t come up with ideas for articles I ask them “What are the secrets in your industry that you’re afraid to talk about? What are your competitors afraid to talk about?” Those questions often generate answers that can turn into great stories. For example, does your industry publish pricing? In the SEO industry they generally don’t, unless they’re lower end SEO firms, so I wrote the post What Does SEO Cost? for Forbes, which has now been read over 100,000 times. Tell secrets, get readers, gain trust. Another way to focus on the reader is to pitch articles that focus on questions your customers ask. People are always asking me “How can I write for Forbes?” so I have a post called How to Become a Forbes Writer. That post alone gets over 2,000 views every single month. If you’re not sure what questions your customers ask go talk to your sales or customer service departments, or take a look at what content on your website is already popular. Then craft your pitch around what you now know people will be interested in. If I’m writing something like this blog post where I’m just spouting off about my own experiences and I don’t have to find any quotes, sources, data, etc., then I can write it in as little as 30 minutes, although 45 minutes is probably a better average when all is said and done (sometimes finding the right stock photo takes 20 minutes by itself). As soon as I’m writing about someone else or their company, we’re up to 2 to 3 hours of work. If I’m going to go source quotes from 3 or 4 people, it’s 3 to 4 hours. And so forth. A well researched, substantive article is going to take me 4 to 8 hours to write. Don’t get me wrong, I like to write those articles sometimes, but if I have the choice of writing for 1 hour or 8, and the benefit to me is the same either way, which article is more likely to get written? Quotes. From authoritative sources, like one of your executives. Data. If you’ve got visuals, so much the better for me, and therefore you. Media. Video, Slideshare, photos, etc. Lede. The lede is defined by Websters as “The introductory section of a news story that is intended to entice the reader to read the full story.” You might also call it an angle, or the whole point of the article. Outline. What do you think the story is? Who’s the audience? What do you think they would find most interesting? What do you think is the best way to present it all? The more you can provide me with the above, the more you cut down the amount of work I have to do, which increases the chances your article will see the light of day this week, instead of sometime in the next month or two as I have the time to squeeze it in, if and when I get around to it. Heck, why not just give me a rough draft article? I guarantee I’ll scrap 75% of it and rewrite it, but it sure makes the process easier. You could also say it’s my job to get quotes from your execs, source the data, and come up with the lede. But it’s not about whose job it is or isn’t–that’s irrelevant. If you’re going to make me spend a lot of time to do a favor for you then I’m going to pass. Not out of spite, or even a lack of interest, but because extra time is something I’m short on. Reduce the time it takes for me to produce an article and you increase the chances of it getting written. That isn’t a guarantee, because I have a line of people who have done that and yet their emails are waiting unanswered in my inbox while I write this blog post…but their chances of those emails turning into articles are much better than yours if you send me a vanilla pitch without the raw materials I need. I hope that for most people reading this, this is great news, because if you’ve been asking yourself “How do I get a writer to write about my company? I don’t get it!” I’m now giving you a recipe to improve your chances. I know writers who put out 10 articles every week. There are two ways they do this; 1) they write as their full time job and have no other distractions, or 2) they have a team of researchers, writers, and editors who are helping them (I know one writer who has a staff of 15 people helping him full time). I’m not a full time writer, and that goes for many contributors out there. Forbes has perhaps 500 staff writers, and over 1,500 unpaid contributors. If you contact a contributor then understand that she has a full time job, probably running a business, and she’s only putting out 3-4 articles per month, and she might have 30 articles she’s already working on. Even if she says she’s interested in writing about your company don’t act as though she’s now obligated to provide you with regular updates and keep you in the loop. Maybe she’ll do that, maybe she won’t, but if she doesn’t it’s probably because she’s super busy, and if you are bugging her every other week asking “When are you going to publish my article?” you may be annoying her and making her wonder if she should reconsider publishing your article at all. Remember, she’s not working for you, you’re not paying her–she’s doing a favor for you. Treat the relationship as such to stay on the writer’s good side. If you have given the writer information that is time sensitive and you need it published by her now or you need to take it elsewhere, then communicate this in a respectful way, not as a threat. This sounds entitled, as though the writer owes you something. That’s still a veiled threat, but it’s respectful, understanding, and reasonable. It could probably be even better, but this should be good enough. But unless you’re worried about the writer publishing what you’ve sent after you’ve decided to give it to someone else, I would just move on without following up at all. If you’re not hearing back from a writer then chances are they’re not going to use what you sent them. Bonus tip: I sent out an email newsletter where I tell my subscribers exactly what stories I’m working on and how they can pitch me. This is the #1 way to get me to include you in one of my stories and get into a big name publication. Sign up here. The catch with pitching me or any other writer is that you’re dependent on our schedules. 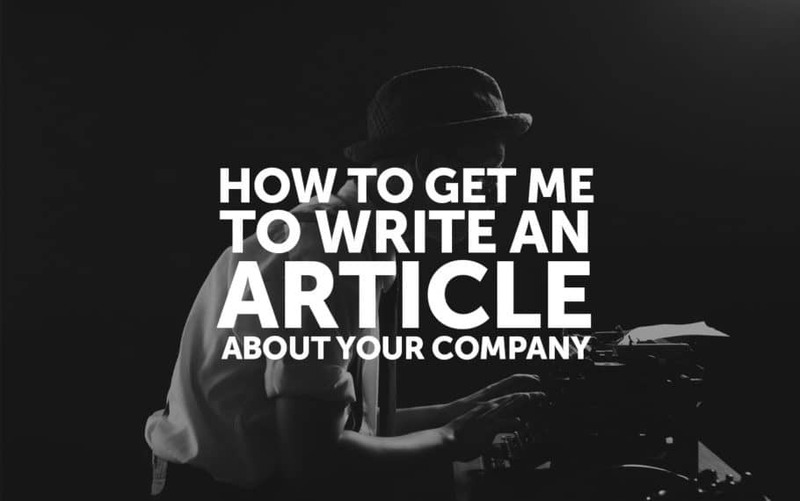 Even if I agree to write an article that includes your company, it may take me a year to do so. I don’t work on an editorial calendar. It’s not first in-first out. Each day I wake up and ask myself, “What is the most urgent/important article to get published, today?” and then I work on that article. The priority can change from day to day. Less important, less urgent articles get pushed to the back, and more important articles are placed at the front. Chances are the article I’ll publish today hadn’t even been imagined yesterday, and the article I was working on a year ago still hasn’t been finished. One way to make sure you don’t get pushed to the back is to pay, that is, to hire my agency for our digital PR services. Then you become the high priority. We’ll work with you to craft articles that accomplish your objectives and pitch these to our media contacts. If you need press fast, this is the way to guarantee it happens when you need it.